How do you get from Chiang Rai to Chiang Khong? Thankfully, it’s a very easy journey. Buses leave the central bus station every hour between 6 am and 5 pm, and take around two hours between the two cities in Thailand. The cost is just a few dollars per person. Read below for more details on the journey. The first and obvious step is to make your way to the bus station. In both Chiang Rai and Chiang Khong, there is only one primary bus station, so it shouldn’t be difficult to find. You can purchase tickets at the bus station when you arrive (there are usually plenty of tickets available) or you can book your bus tickets between Chiang Rai and Chiang Khong prior to your arrival just to help with your planning. Use the link above or the form below to check what’s available online. In the end, you’ll be boarding a bus that probably looks something like this. Look for the timetable shown above, and that’s where the bus departs from. The bus doesn’t have A/C (air conditioning), but I actually found it much more pleasant to travel on this bus. All the windows, and both doors were open for the whole journey, and there was a very nice breeze blowing through the bus. When the bus stopped, all the fans on the bus switched on automatically. Thailand bus journeys always seem to be interesting, and this one was no exception. I sat on the back seat right next to a huge washing machine that someone had bought in Chiang Rai, but that needed to be delivered to Chiang Khong (yes, this happens). When we got to Chiang Khong, there was a woman waiting for it. I could never imagine a washing machine (or anything else) being delivered by bus in the UK! As well as the washing machine, there were lots of smaller packages that the bus dropped off at various shops along the way. And at one point the bus stopped on a desolate stretch of road, and a motorbike pulled up alongside. The rider handed the conductor a package that needed to be dropped off at a shop further along the route. It’s a quick and cheap way of getting goods delivered without having to use the postal service. When you get to Chiang Khong, there’ll be a few tuk-tuks waiting to transport you to your hotel. We paid 60 baht ($2, £1.35) for the journey to our hotel – the Portside Hotel. 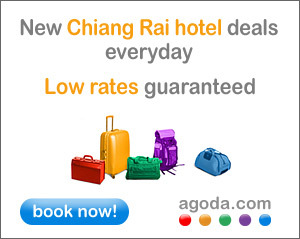 Click on the Agoda link below to find a great selection of hotels in both Chiang Rai and Chiang Khong.